Our “Standard” Quick-Release Pull Pins are also known as spring plungers, hand retractable spring plungers or stubby spring plungers – due to their shorter body when compared to a Quarter-Turn Locking Spring Pin. The Quick-Release Pull Pin body is threaded into the application, with ring on outside surface. Pull the ring to retract spring-loaded tip and allow adjustments. Release the ring to lock Pull Pin tip into desired hole location. Chamfered tip allows for easy alignment. Spring Plungers are ideal for adjustable tubing, tooling, latches, fixtures, gates, and much more. Steel Lanyards or Nylon Lanyards may be added to the Spring Plunger ring as a low cost “pull actuator”. A high-quality imported pin provides dependable functionality at a competitive price. Quick-Release Pull Pins are stocked in low carbon steel, zinc plated. Special sizes and materials, or domestic versions, can be made in-house. Choose a Pull Pin Made to your exact specifications. Ask about our NEW Auto-Lock Safety Pull Pin! The new Pull Pin features a retractable tip that lock into an extended (forward) position automatically. 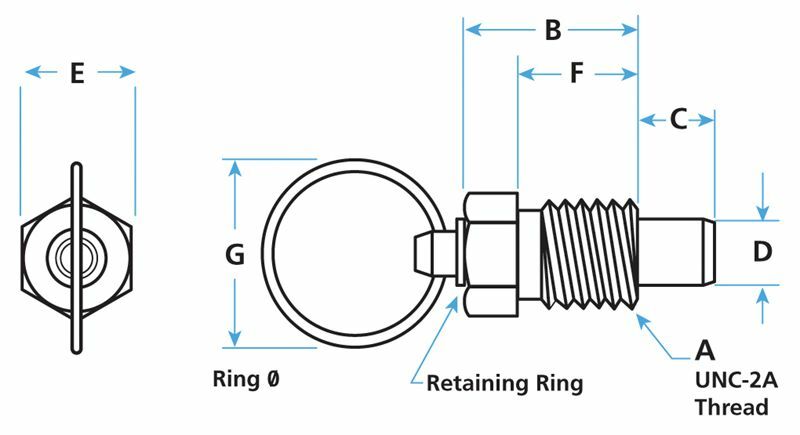 Conventional spring-loaded Pull Pins and hand retractable spring plungers do not lock forward, allowing unintended retraction and disengagement due to vibration, movement and irregular mating holes. Our new forward-locked design means that the tip remains in an extended, locked position until manually disengaged by pulling the ring. 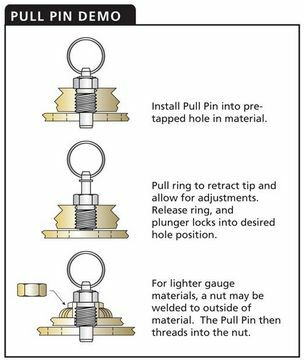 Pull Pins are also known as spring plungers or hand retractable spring plungers. The Pull Pin body is threaded into the application, with ring on outside surface. Pull the ring to retract spring-loaded tip and allow adjustments. Release the ring to lock Pull Pin tip into desired hole location. Chamfered tip allows for easy alignment. Spring Plungers are ideal for adjustable tubing, tooling, latches, fixtures, gates and much more. Steel Lanyards or Nylon Lanyards may be added to the Spring Plunger ring as a low cost “pull actuator”. Our unique Pull Pin design features a one-piece, case hardened, spindle for maximum strength and durability. This one-piece design also translates into lower production costs. A superior design at a lower price! Pull Pin stock sizes are low carbon steel, zinc plated. Special sizes and materials are available. Ask about our NEW Auto-Lock Safety Pull Pin! This new Pull Pin features a retractable tip that locks into an extended (forward) position automatically. Conventional spring-loaded Pull Pins and hand retractable spring plungers do not lock forward, allowing unintended retraction and disengagement due to vibration, movement and irregular mating holes. Our new forward-locked design means that the tip remains in an extended, locked position until manually disengaged by pulling the ring.